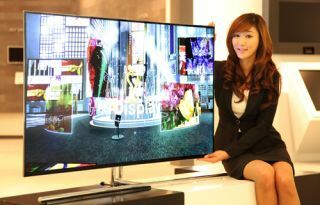 LG sells 200 OLED TVs in three months in Korea; predicts "substantial numbers" in 2013 | What Hi-Fi? LG has confirmed it has sold 200 OLED TVs since the company’s first 55in OLED TV went on sale in Korea. The LG 55EM970V OLED TV opened for pre-orders in Korea in January before going on sale in February. Originally unveiled at CES in 2012, the LG OLED TV is also now available for pre-order in the UK, having gone on sale at the start of March in Harrods, London for £10,000. Around 100 sets were reported to have been pre-ordered after six weeks in Korea, and LG’s Home Entertainment ??? Hugo Shin confirmed at a briefing at LG HQ in Seoul today that 200 have now been shipped. Shin said LG expects to sell “substantial numbers” of OLED and 4K Ultra HD TVs over the next 24 months, despite these initial slow sales. Clearly very expensive now, Shin believes OLED TVs could be a similar price to existing high-end LED screen in as little as two or three years. LG believes OLED TV offers particular performance improvements in terms of colours, contrast and viewing angle, plus at just 4mm thin, holds plenty of aesthetic appeal, too. As well as this 55in flatscreen OLED TV, LG is continuing to develop curved OLED TVs, as first revealed at CES 2013. Bringing the cinema feel to TV screens, based on the curved screen of IMAX cinemas, LG says curved OLED TVs will deliver a more immersive experience as well as delivering the optimum viewing distance to every part of the screen. The LG 55EM970V OLED TV (above) opened for pre-orders in Korea in January before going on sale in February. Around 100 sets were reported to have been pre-ordered after six weeks in Korea, and LG’s director of home entertainment communications Hugo Shin confirmed at a briefing at LG HQ in Seoul today that sales have hit 200. As for plasma sets, LG says it will keep making PDP TVs as long as there is consumer demand for them, but views them as a budget offering.